Colours fall into either warm or cool sides of the spectrum, with reds, yellows and oranges promoting excitement, energy and confidence, while blues and greens act to calm the nerves, enhance performance and focus attention. Then there are the neutrals, which are still popular choices for modern offices. 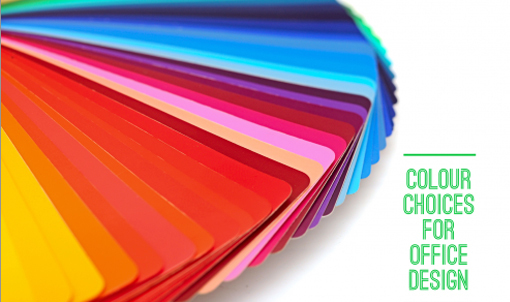 Keep reading to find out more about the psychology of the colour in the workplace. Blue is an intellectual colour and promotes thinking, performance and creativity. Psychologically soothing, blue is best in conference rooms or spaces where people collaborate to encourage brainstorming and improve productivity. Choose the right shade of blue though, too dark and you can make people feel sad. Green is the go-to colour for making people feel calm, relaxed and focused (what every manager ideally wants for productive staff) it can also make them feel happier and rejuvenated, thus promoting health and wellbeing (and less sick days). Use various shades of green throughout the office to encourage a calm and purposeful energy. Red is a creative and motivating colour. But be careful with going overboard with this emotionally intense colour – it can stimulate the heart and breathing and make people feel overwhelmed. But on the upside red is an excellent accent for furniture, or consider it as a frame for a motivational sign. While painting an office, a cheery yellow may seem a good idea on the face of it, yellow can make people lose their tempers. Too much yellow can also cause anxiety. Tone down the use of this hue to smaller objects within the room to enhance concentration and encourage optimism. This energetic and cheerful colour encourages social interaction, so it’s perfect as an accent colour in spaces you want people to be creative and motivated. But like red and yellow, orange should be used sparingly if you want to keep the peace. White and grey have always been popular colours for offices because they go with everything. Grey is said to promote creativity since it doesn’t offer any distractions while white is clean and can make people feel optimistic. Secure brown is another traditional office colour and is best used in floors, furniture and fabrics for a grounding effect on spaces that are large and airy.